The Kerry Blue Terrier is the national terrier of Ireland, having been developed in County Kerry, and is known as the Irish Blue Terrier. 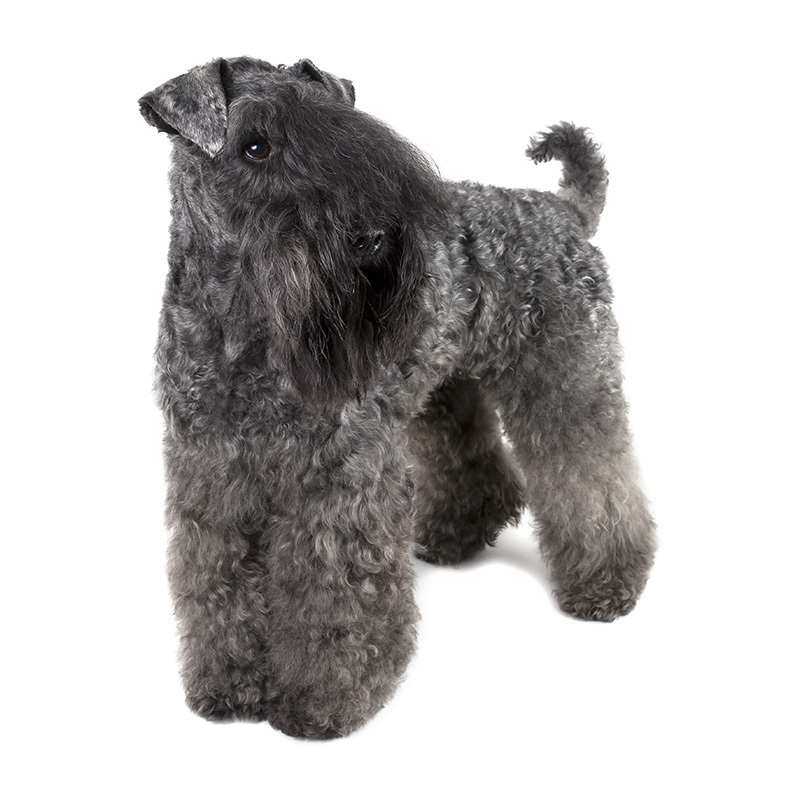 There is little literary reference before the 1800s concerning this breed, but it is thought that the breed is derived from a combination of the Portuguese Water Dog, the Spanish (or Russian) “Blue Dog,” the Soft Coated Wheaten Terrier and possibly Irish Wolfhounds, Irish Terriers, and old black terriers. However, no one knows for sure. They were originally used for hunting small game and birds, killing rodents, and guarding the homestead. They also were successful sheep and cattle herders. Animated, comical, entertaining, and playful, the Kerry Blue has a reputation of making people laugh. They are very affectionate and love to be with their family. They have the typical terrier personality by being bossy, inquisitive, tenacious, feisty, stubborn and brave. The Kerry Blue needs an owner more stubborn than they are in that they require consistent obedience training for their whole lives. They are prone to dig and chase animals. This dog does very well with children, enjoying rough and tumble play and being tolerant and understanding of the child. They are very protective and make good watchdogs. The Kerry Blue Terrier is an intelligent, all-purpose dog who makes a wonderful family addition. These are people-oriented dogs who are sweet, loyal, fun-loving, and full of love and life. Kerry Blue Terriers usually weigh between 33 to 40 pounds and stand approximately 18 to 20 inches tall. They are a medium-sized dog with a sturdy and muscular build. Their coat is thick and silky and is usually bluish-gray as an adult. They are usually born black and, if correct, have the dominant gene for coat fading. The color begins to fade to gray and acquires its adult solid slate gray (blue) color by 18 months. They also usually have a standard haircut with a facial trim that reminds one of a Prince during the Revolution days. The Kerry's coat may be high maintenance, but at least it doesn't shed. However, its beard often soaks up a good deal of water, which it will then distribute like a water hose. These dogs can be bad with other dogs, cats, and other animals, so you'll need to be the dominate personality with this dog.